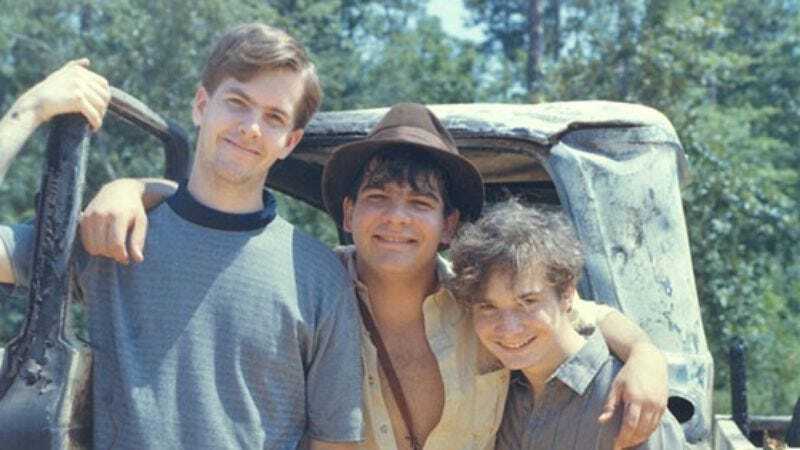 Long before Gus Van Sant’s shot-for-shot remake of Psycho hit theater screens, three 11-year-old boys attempted to recreate their favorite movie, Raiders Of The Lost Ark, in their backyards. They did it not for fortune or glory, but simply out of their love for cinema. Eventually, Eric Zala and Chris Strompolos’ obsession with completing the film—which they began shooting in 1982—became the subject of a documentary, Raiders! The Story Of The Greatest Fan Film Ever Made. Now that documentary has been acquired by Drafthouse Films, and is coming to a theater near you. While the boys completed most of their Raiders remake by 1989 on a budget of allowances, much like Abner Ravenswood and Indy, fallout over a girl saw Zala and Strompolos going their separate ways before finishing the film. So Raiders! not only delves into the seven years spent making the film as youngsters, but chronicles the two men reuniting with their childhood friends 20 years later to complete the missing piece to the puzzle: the “Flying Wing” scene where a Nazi mechanic meets his gruesome end via a plane propeller. Raiders! The Story Of The Greatest Fan Film Ever Made will receive a limited theatrical release in the summer of 2016 before being released on VOD and Blu-ray later in the year.